We can boast a guest book full of authors, journalist, musicians,actors, painters and sculptors etc. However, we take a personal interest in all the guests who come. We believe that the compromises are always worth it. It is not a question of whether you like our hotel, either in it's own right or in comparison with any where you may have stayed before. It is as simple as this, you are either part of it, or you are not, you can choose to make the connection that thousands of others who return again and again have, to appreciate and understand the uncommon experience that we offer here. 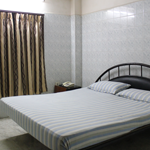 In any place of the world an individual or a family wants a good place to relax their toe and where they feel they are at home and “Nice Guest House” situated in Goregaon (West) is a place where their desire to relax becomes reality. The guest house comes up with a new revolutionized idea in lodging be it cozy beds and Air Conditioned Dormitory or in a private room for you and your family.